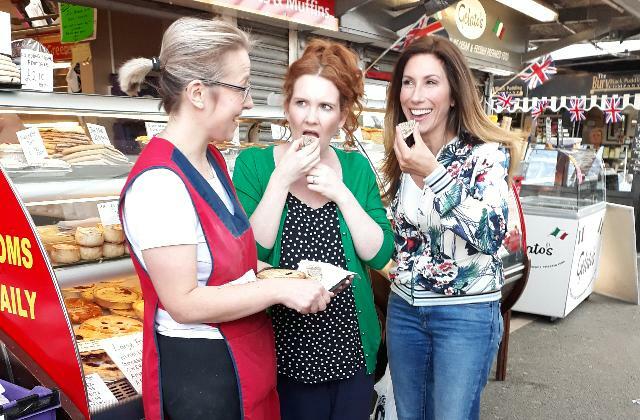 Soap Stars Gaynor Faye (Megan from Emmerdale) and Jennie McAlpine (Coronation Street's Fizz) visited Bury Market and sampled some of the fine Lancashire fare on offer. Filming for a piece for ITV due to be broadcast w/c 4th June the duo undertook a whistle stop tour of the Market and enjoyed some of the great food on offer. In addition to trying Whippy's Pies, Chadwick's Black Puddings and a variety of cheese from Cheese Plus they were offered a selection of pies and pastries from Harry Muffins.